button for retrig and legato. The original Minimoog is always set to legato. Also there are sliders for fine tuning that is not present on the Minimoog, but these works just like the pitch knob, only that it is more sensitive. Its just there to help you, because the Minimoog sounds best when it is almost in tune, but not 100%. Tuning plays a big part in the Minimoog sound. Also release in the envelope generators is added. The upper section is where you create sounds. The last row of knobs represent new features that we have added that is not present on the original Minimoog. These features are midi control, oscillator sync, LFO, autopan, overdrive, chorus and a delay section that you can sync to host BPM. The LFO has 3 functions. 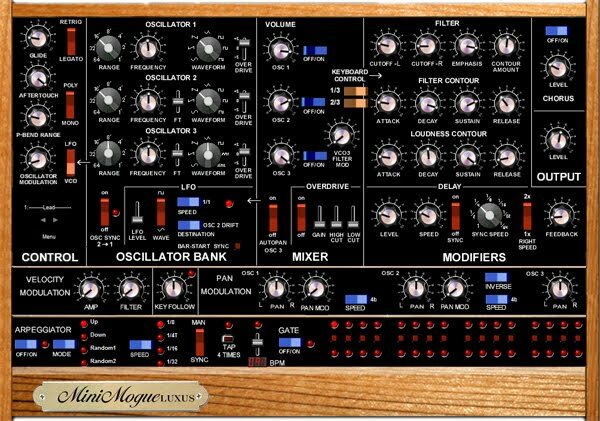 At low level settings it is intended to simulate the small tuning and instabilities in an original Minimoog. At high level settings it simalates the tweaking of a knob so that you can focus on the playing. The third function is to give oscillatorsync pitch variations to work with. It also syncs to host BPM. Extract the .dll file to your VST folder, search for it in your DAW.